"New" Skype for Windows 8; Not Your Skype for Windows "Classic"
along with some sample screen shots in the announcement post. Basically once installed from the Windows Store, Skype is accessed from the Windows 8 Start screen as a live tile. While using your Windows 8 PC or Surface tablet, Skype is always available in the background and notifying you of incoming chat messages as well as calls. But it’s integrated into the overall new Windows 8 user experience which has had mixed reviews. Transitioning to Windows 8 is not the normal transition to a new Windows version and will have a learning curve that needs to be accepted by the Windows PC user base. Of course the major difference is that Windows 8 can also support touch screen devices, such as tablets and touch screen PC’s. One question is how does the focus on a touch-based device impact the user experience on the legacy PC? Skype for Windows 8 will be accessed through your Microsoft ID (which actually is required to launch Windows 8 itself). It will be necessary to merge your Skype account with your Microsoft ID/profile; if not already done, this happens the first time you use Skype for Window 8. Since the launch of Skype 5.11 beta for Windows I have been logged in through my MS account with no impact on my Skype activities. Keep in mind that this linkage implies that only the Skype account linked to your Microsoft ID can be running Skype for Windows 8; running or switching to a second Skype account would require Skype for Windows “Classic” on the Windows 8 legacy desktop. Skype for Windows 8 will be “always on”, available in background. Hopefully the user will be able to manage the level of user ‘interruption” such that Skype notifications do not become an “annoying” disrupter of other Windows 8 activities. 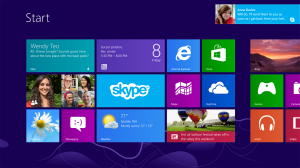 Skype for Windows 8 supports Skype’s traditional features such as group chats, video calling and SMS messaging. Also calls can be placed to users on any Skype endpoint, PC’s, iOS/Android tablets (including Kindle Fire) and smartphones, TV’s, etc. Windows 8 RT, along with Surface and other supporting tablets, is Microsoft’s first entry into the tablet market space. With the iPad and Android tablets, I have encountered many who use Skype on these devices as their main communications provider when traveling – usually by finding a WiFi access point. Also these devices can also have the potential to replace desktop phones in a business. Will Surface be in the competition amongst tablets to become the primary communications device for both personal and business use in the home or office, replacing legacy phone sets? Where will these devices be positioned relative to using a smartphone? Skype for Windows 8 conversations can be launched through the Microsoft People application – an integrated “address book” or contact “hub” that incorporates social networking and other contact information. Outlook.com provides an initial indication of how the People application is intended to work. Bottom line: Skype for Windows 8 represents the first deep integration of Skype into Microsoft offerings. Not only will Skype offer a new user experience; simply coming up to speed on the overall Windows 8 user experience will offer its challenges. Call it “New” Skype for Windows, available to launch and participate, on demand, in real time conversations while working with Windows PC’s and tablets. Does it become a feature that helps justify Microsoft’s $8.5B acquisition of Skype and drives Microsoft revenues through Windows 8 adoption? Our only measures may be the increase in the monthly Skype user number, most recently reported in Microsoft’s quarterly report as now at 280 million along with the adoption rate of Windows 8. Skype for Windows 8 will be available in the Windows Store on Friday, October 26 at the time of the Windows 8 launch. I hope to have more information for a post on launch day.